Sherry Parker(Taraji) busy works makes her job to transfer from Detroit to Beijing(China). So she along with her 12 year old son Dre Parker(Jaden) goes to China. Jaden misses all his freinds in Detroit and he feels as a lonely fellow in China because of cultural differences. He unfortunately fights with the enemy who is master in khung-fu . So poor little boy wants to learn kung-fu in order to get away fear. There is nobody for him to teach karate and a maintenance man Han(Jackie Chan) thaughts him kung-fu .What are the consequences the little boy faces in China? Why he wants to learn kung-fu is rest of da story. 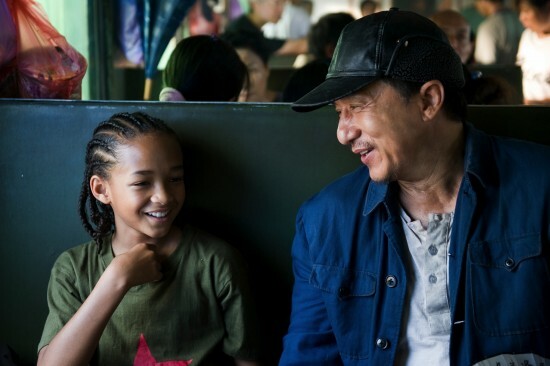 Jaden Smith acted superbly.Being the son of Will Smith ,may be he got his acting skills from his father Will Smith. The hero in this movie is no doubt , the wonder kid Jaden Smith. Jackie Chan has given a crooning performance. My Verdict - A Refreshing entertainment .